Now, here's a car that doesn't receive much attention these days…the BMW 1 Series. Its first iteration was introduced in 2004 and was available in hatchback, coupé and convertible body styles. Since the arrival of the second generation in June, 2011, the coupé and convertible models have been marketed as the 2 Series, leaving the 1 Series as just a family-oriented hatchback. When BMW initially launched the rear-wheel drive 1 Series it bucked the industry norm for family hatchbacks to be front-wheel drive – which continues to make sense from a packaging perspective. 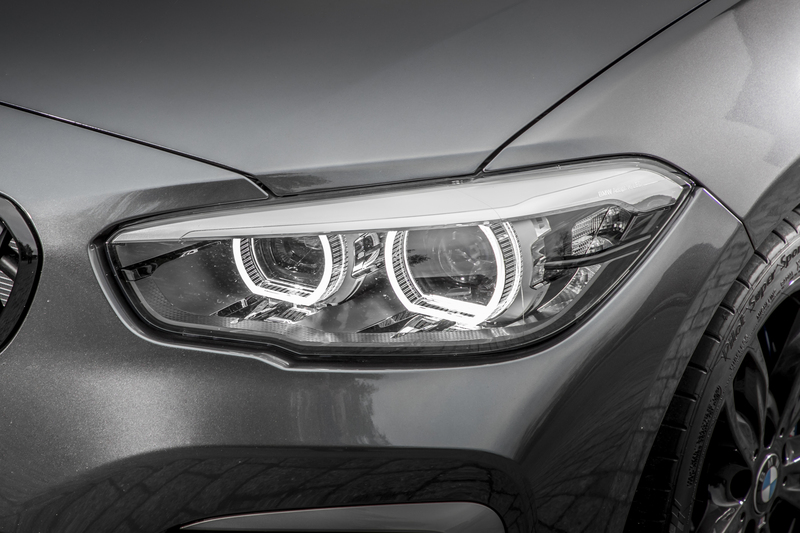 But BMW was – and remains – all about the pure driving experience. In April 2015, the car received a raft of external and internal improvements to keep it fresh and competitive as the model it entered its twilight years. A range update was rolled out in July 2017, with the highlights including minor interior and exterior styling tweaks for higher trim levels, plus infotainment and technology upgrades and a new 'Shadow Edition' trim. An all-new, third-generation 1 Series is expected to debut later in 2018 and will share its front-wheel drive architecture with MINI and the 2 Series Active Tourer. While far from an ugly duckling, the BMW 1 Series has never been the prettiest hatchback available during the past fourteen years. Its mid-life model facelift of 2015 most certainly improved the aesthetics with wider light clusters front and rear making a positive difference and there's no getting away from the fact that the 1 Series has always been distinctive. As within many BMW line-ups, the M Sport models in strong colours and riding on bigger wheels usually look the best. The most striking variant is the flagship M140i which gets its own styling cues to denote its impressive potency. Inside, the BMW 1 Series follows a similar driver-focused template to the company's larger cars. The previous-generation 1 Series was let down by its scratchy and mixed plastics, so for this iteration, the German car maker has made a concerted effort to improve interior quality, evidenced by the introduction of new dials and air-conditioning controls in 2015. It feels special behind the wheel, too, with an upmarket ambiance. The front seats are mounted low to the floor for a sportier feel but visibility is decent, with no major blind spots, even when performing tricky manoeuvres. 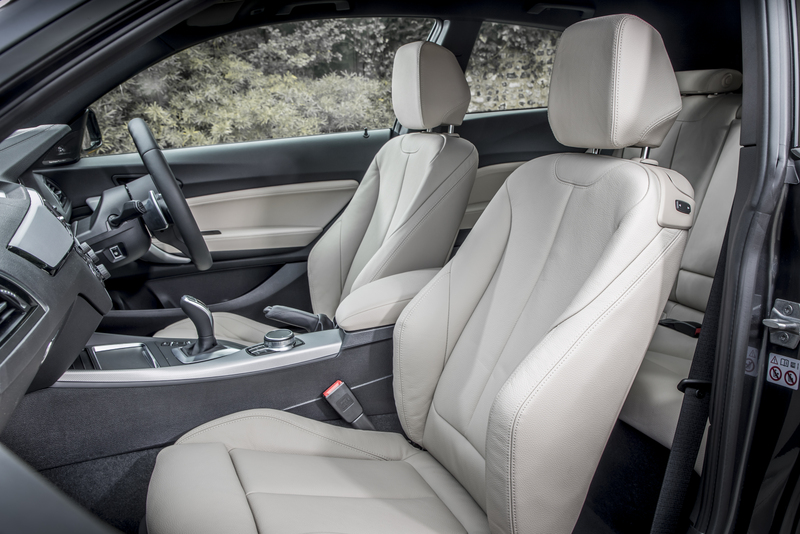 The seats offer good support and will hold you firmly in place even if you decide to drive the 1 Series with a dollop of enthusiasm – which you should from time to time. There's a wide range of adjustment, too, so with a bit of tweaking most drivers will be able to find a comfortable position. 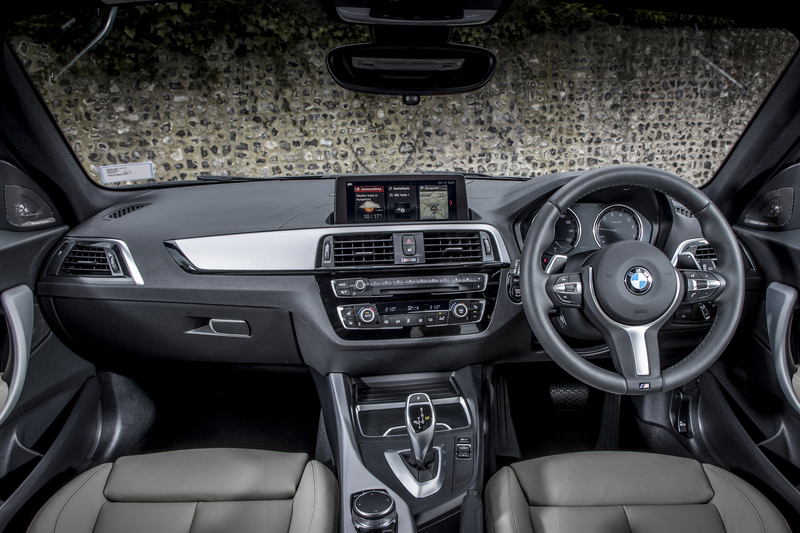 From the driving seat, the 1 Series doesn't quite have the wow factor and touchscreen technology of rivals like the Volkswagen Golf and SEAT Leon, but the dashboard has a clear layout and all the controls feel solid and robust. Most of the 1 Series' dashboard is covered in dark, black plastic, but pick one of the sportier trim levels and you'll get brushed aluminium or coloured inserts that give the smaller Beemer a little more style. Caveat; these models come with black headlining, which makes the car feel a little cramped and claustrophobic inside, even though it's actually bigger than the previous-generation model by quite a significant margin. 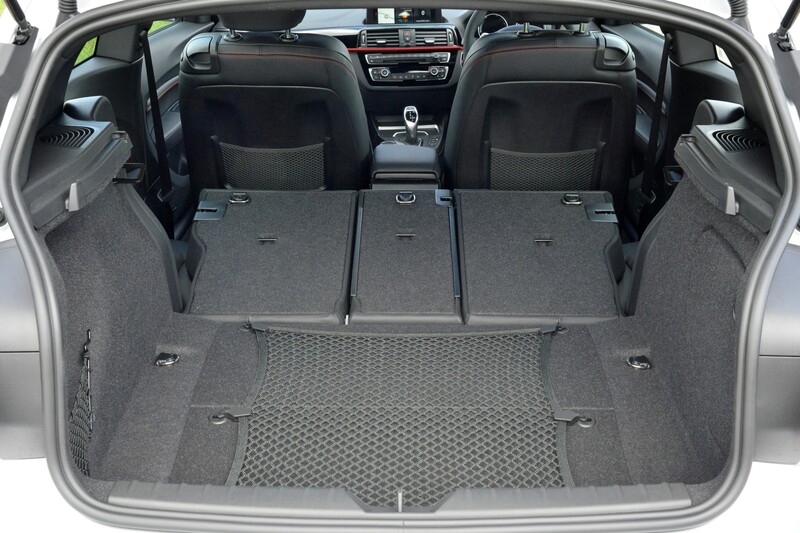 The 1 Series' boot can carry 360 litres of luggage with the rear seats in place. Drop them down and they create a practical and almost flat 1,200-litre load area. A low lip means you might be surprised by what you can lift into the back, with larger suitcases and bikes posing no problem at all, though the boot opening doesn't seem as wide as some of its rivals. As standard, the 1 Series comes with a 60:40 split between the rear seats, but you have the option to specify a through-loading 20:40:20 split for carrying long and narrow awkward items such as skis or flat-pack furniture. For even more practicality, there's a full-length luggage separator available. 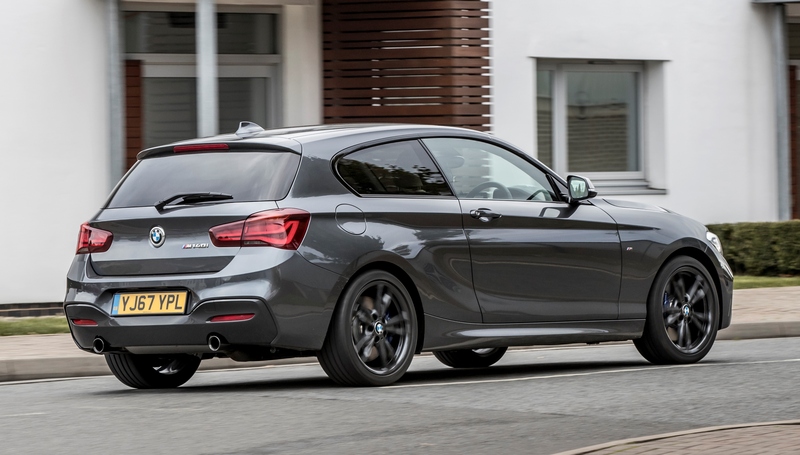 The present BMW 1 Series range walk-up looks like this: SE, Sport, M-Sport, M Sport Shadow Edition and M Performance which features the mighty M140i. Kit levels are high and even the range-entry SE gets 16-inch alloys, a 6.5-inch colour screen with iDrive controller, climate control, fog lamps, DAB tuner, three-mode performance control (EcoPro, Comfort and Sport), cruise control and BMW's ConnectedDrive service which includes emergency call,satnav, online services and real-time traffic updates. Sport adds larger 17-inch alloy wheels, ambient lighting, fog lamps, an additional 'Sport+' driving mode (which turns off the traction control), a sportier instrument cluster, sports seats in the front and a sports-focused steering wheel. M Sport takes things a little more seriously and adds 18-inch alloys, LED fogs and headlights, M Sport suspension and a sprinkling of M Sport designations inside and out. Shadow Edition buyers will enjoy black alloys and darkened rear lights with LED light bar. The full gamut of BMW engine efficiency and performance is covered, from an 80mpg-plus diesel to a rapid six-cylinder turbo hot hatch. The petrol range begins with the 118i, which uses a 1.5-litre turbocharged three-cylinder petrol engine with 136hp and offers 220Nm torque. 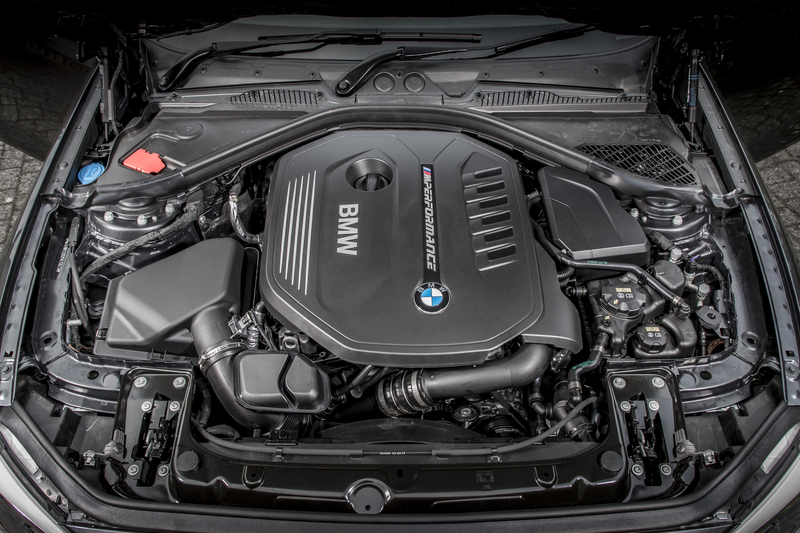 The 120i and 125i both get a 2.0-litre unit and the M140i uses a twin-turbo 3.0-litre straight six to generate 335bhp. On the diesel front, there's a range-entry 1.5-litre turbocharged three-cylinder engine that offers 115bhp and 270Nm of torque. It's the same engine as found in the MINI Cooper D and badged 116d here. The 118d, 120d and 125d models stick with a larger four-cylinder 2.0-litre diesel engine, tuned for different power outputs. A six-speed manual gearbox is standard, though higher-powered models can be specified with an eight-speed automatic. The 120d is available with xDrive four-wheel drive for added traction but this increases the weight. The manual gearbox feels solid, if a little notchy through the gate, while the automatic is brilliant – smooth and quick shifting. The eight ratios of the auto mean it stays in the engine's sweet spot more of the time. Keen drivers will not be disappointed with the BMW 1 Series as it offers more entertainment than almost any car in this class, thanks to the agility from the rear-wheel-drive layout, powerful engines and a balance of well-engineered handling prowess and ride quality that rivals can't match. Unlike some premium hatches, the 1 Series rides with a degree of sophistication. 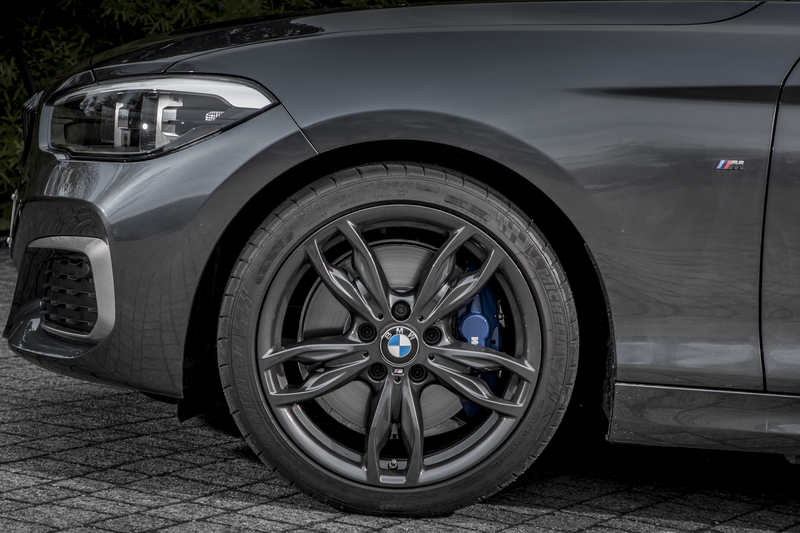 On smaller alloy wheels it will take bumps, crests and potholes in its stride, especially at low speeds. Motorway drives are also fairly cosseting, and even expansion joints will only send a muted thud into the cabin. Only the VW Golf rides with the same suppleness in this class. It's good enough that you don't really need to pay extra for the adaptive dampers - unless you really want the extra benefits they bring to the ride. The little Beemer is sharper to drive than many of its peers, with neutral, balanced handling and decent levels of grip. Part of this agility is down to the sharp and quick steering. Throw the car with too much vim into a B-road corner and the body control can become a bit loose, with a fair amount of pitch and lean. Adaptive dampers help this and improve ride comfort and agility. There are also xDrive four-wheel-drive versions with the 2.0-litre diesel engines, which are slightly less sharp than the rear-wheel-drive cars and are ideal for those concerned about getting stuck in wintry weather. 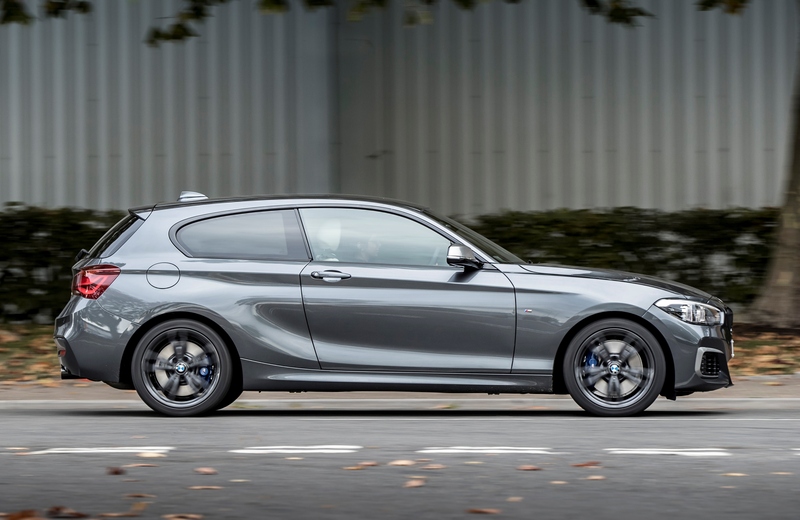 An entertaining drive, high material and build quality and a range of engines that goes from extremely frugal to pretty darn quick, the BMW 1 Series has it all – on paper, at least. Unfortunately its rear-wheel drive set-up – currently unique in the family hatchback segment – means it loses a little space compared to rivals like the Volkswagen Golf and Ford Focus. The next 1 Series range is going front-wheel drive, sharing its architecture with MINI and the 2 Series Active Tourer. If you like your daily driving experience to offer more engaging dynamics and B-road chuckability, the current 1 Series still cooks on gas and is hard to beat, regardless of which model you decide to take home. ➤ Check out our current special offers on the BMW 1 Series here, then call our award-winning Customer Service Team on 0800 043 2050.